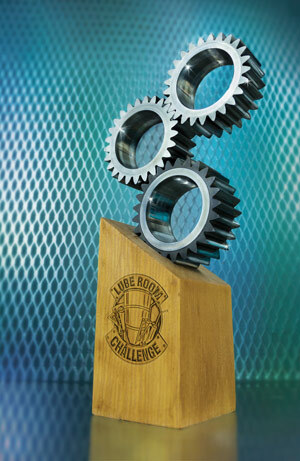 As part of its annual Lube Room Challenge, Machinery Lubrication once again asked readers to submit exceptional lube rooms that incorporate best-practice features. 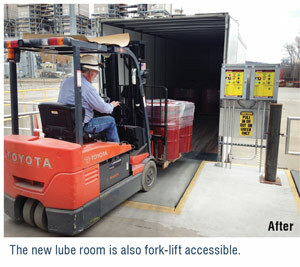 Several readers were proud to show how their lubricant storage and dispensing methods have been transformed. 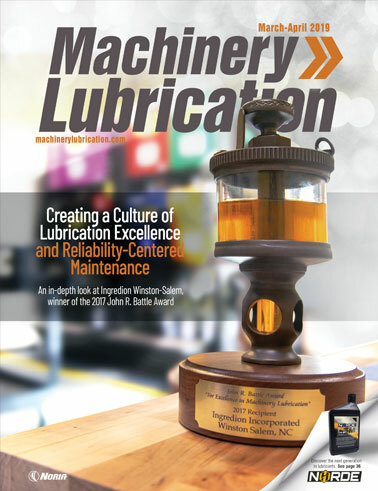 The following entries illustrate how a properly designed lube room marks an important step in the journey toward lubrication excellence. AGCO is a global agricultural machinery manufacturer with five factories in Brazil that produce tractors, combines, sprayers and implements. The maintenance department in Canoas had the goal of increasing the availability and reliability of its equipment machining and assembly line as well as reducing machine downtime, especially those stoppages caused by lubrication failure. In 2012, it was apparent by the condition of the lube room that something needed to be changed. 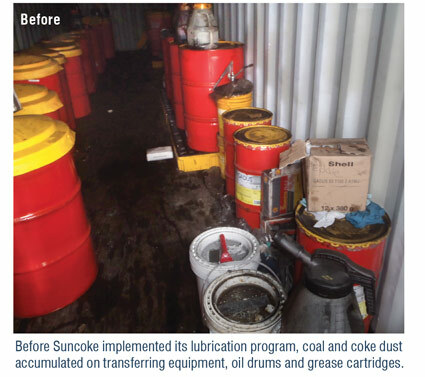 It was common to see unmarked oil drums, grease drums without lids and mixing of different types of lubricants caused by a lack of identification on packaging. Lubricant consumption was also high, as many oil changes were made to compensate for the cross-contamination occurring in the lube room. In early 2013, after an analysis of the maintenance group and an audit of the lubricants in use, an action plan was developed to implement best practices and training of the lubrication staff. This would lead AGCO Brazil to a model of world-class lubrication. The organization’s team of lube technicians received training on lubrication practices, which enabled these professionals to perform tasks with the highest quality standards. A new lube room was built to solve the problems of contamination and lubricant blending while also improving cleanliness. The current lube room incorporates storage tanks with a filtering system to ensure a higher oil cleanliness level along with color-coding to identify lubricants and storage containers to prevent the mixing of different lubricant types. Every machine’s lubrication point also has a nameplate that indicates the correct lubricant for each application. Today, oil sample reports show that the contamination problems have been resolved. Oil consumption has also decreased, as it is no longer necessary to change oil prematurely. This allowed AGCO to achieve a cost savings of $30,000 in 2013. Over the past 18 months, Compass Minerals’ division in Ogden, Utah, has put considerable time and money into creating a best-practice lube storage and dispensing building as well as in taking oil samples and attaching color-coded lube identification tags to each piece of equipment. The company is now seeing great results from its efforts and has even noticed a change in its employees. Compass Minerals began its journey by formulating a plan and obtaining management buy-in. Starting from the ground up, the approach involved training technicians, developing lube routes, incorporating air breathers, purchasing new lubricant/oil-handling containers, and constructing a new lubrication building with storage racks and a filtration system. After the new lubrication building was completed, an open house was held and daily training was provided for two weeks. This was intended not only to celebrate the opening of the new lube room but also to allow all maintenance and operations personnel to see and learn about the new building, including how and where to get oil/grease and why oil cleanliness is so important. Noria’s “Lubrication Basics for Machinery Operators” video was shown as part of the training. In 2015, Compass Minerals plans to have new color-coded grease-fitting protector covers and oil sample ports installed on all equipment. The company is committed to maintaining a world-class lubrication system and has already started seeing cost savings/payback, which is expected to continue for years to come. The employees are excited to see what the future holds. When beginning its lubrication program, the Indiana-Kentucky Electric Corp. (IKEC) in Madison, Indiana, had an old lube room that was dusty, dirty and wet when it rained. Cross-contamination was widespread. 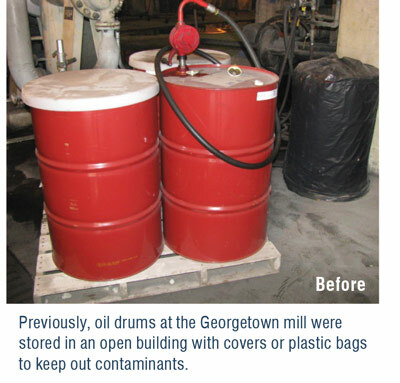 There were no desiccant breathers, and the same pumps were used to remove oil from all drums. The manual dumping rig also presented a safety hazard. In addition, there were no methods for managing inventory or rotating the stock of lubricants. 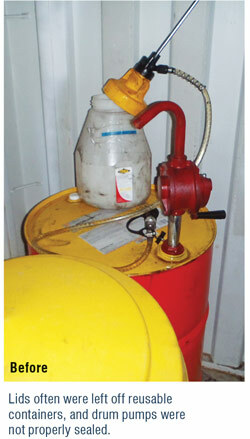 Greases were stored wherever they were used and not according to best practices. Miscellaneous filters, parts, etc., were also stored in the lube room. At one point, IKEC had 177 drums of oil, some of which were 10 years old. There were also more than 1,600 tubes of grease, which would have been enough to grease the company’s equipment for 40 years. Obviously, no lubricant consolidation or just-in-time procurement methods were being utilized. 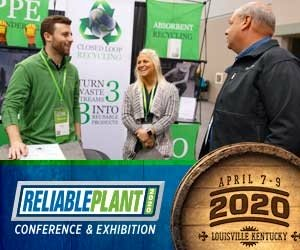 With the company’s flue-gas desulfurization facility coming online along with all of its new equipment, there was no place to store lubricants. By working with its oil supplier, IKEC was able to reduce its inventory to 50 oil drums. It also consolidated greases and other lubricants where possible. Reducing its inventory by 60 percent allowed IKEC to make a number of modifications to its lube room. A heating, ventilation and air-conditioning (HVAC) system was added to maintain a climate-controlled temperature of a constant 72 degrees. 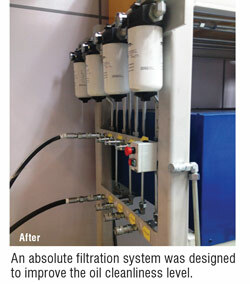 A filtration system with 16 filtering compartments, tanks and dispensers was also purchased. Upgrades were made to the room’s electrical system, lighting, flooring and drum storage racks. The amount of oil ordered, which had been excessive, is now controlled. The new state-of-the-art lubrication warehouse is the epitome of proper contamination control and safety practices with reduced clutter, a new drum racker and drum lift, a color-coded filtration system and matching oil containers with labels. Suncoke Energy’s Brandon Lisch has been waiting for the chance to show the improvements that have been made at his facility in Middletown, Ohio. Prior to implementing a lubrication program, all lubricants were stored outside or within an opened conex trailer. Coal and coke dust accumulated on transferring equipment, oil drums and grease cartridges. Oil pumped directly from the drums without prior filtration or testing of lubricant properties. There was no lubricant identification system in place, and lids were left off reusable containers. Drum pumps were not properly sealed or dedicated to specific lubricants. 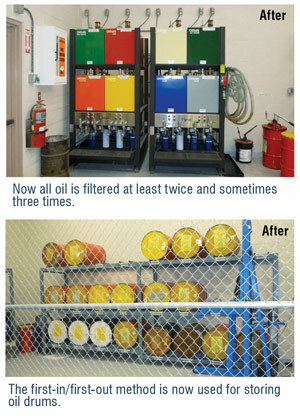 The facility had no stock rotation system or training on lubrication best practices. Dirty lubricants were applied to machinery, and cross-contamination of lubricants occurred. Poor oil sampling practices were also in use. 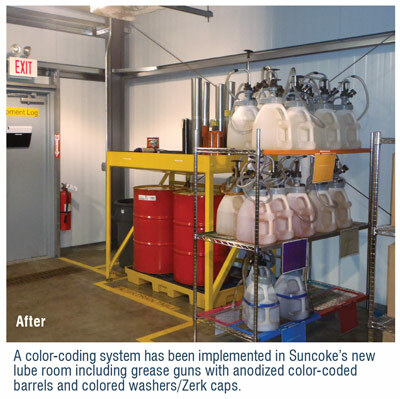 In just over a year’s time, Suncoke was able to correct these issues. The facility’s current lubrication practices include dedicated storage tanks with filtration capabilities, reusable totes with a quick-coupling system and desiccating breathers, a quality-assurance testing program for oil received from the distributor, and dedicated portable filtration carts. A new lubrication building was designed and constructed for housing lubricants in a controlled environment. There is also controlled access to the lube building. A color-coding system has been implemented including grease guns with anodized color-coded barrels and colored washers/Zerk caps. 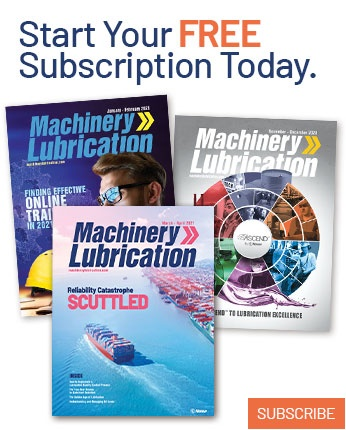 The first-in/first-out lubricant rotation method is being utilized, and employees are trained on lubrication best practices. In addition, filtration of new oil within drums must now meet the company’s set cleanliness standards. Suncoke’s next step is to take its program to a world-class level. International Paper’s mill in Georgetown, South Carolina, is in the process of installing lube rooms throughout the mill as part of its lubrication excellence program. The “Powerhouse” area was the first to complete its lube room. Prior to building the new lube room, barrels of oil were stored in an open building under turbine generators. This area of the building was impossible to keep clean due to large roll-up doors that remained open and the close proximity of ash-handling conveyors. Transferring oil from drums to portable containers was not possible without introducing contamination. 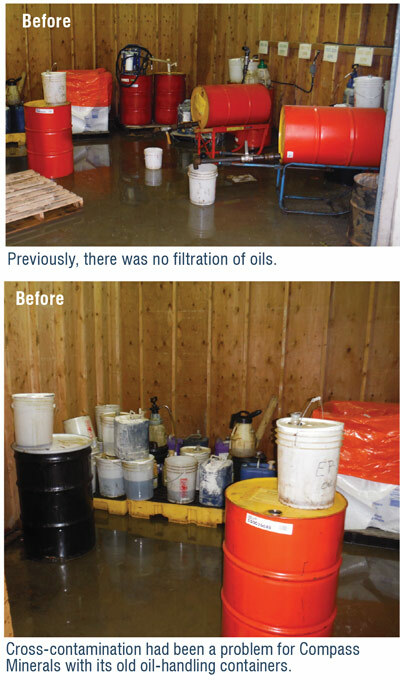 While the lubrication technicians did an excellent job of keeping the drums covered and the oil as clean as possible, everyone knew that a lube room was essential in achieving the company’s goal of world-class lubrication. Many hours were spent researching what was available and how to build and equip a lube room based on the limited funds and space. Eventually, the decision was made to use self-contained pump and filter assemblies which have the same components as the filter carts that had been used previously. The same filter unit has also been installed on hydraulic tanks in this area of the mill. The company plans to utilize this work to standardize lube rooms across the mill as much as possible. The filter units in the lube room are supplied with 55-gallon drums of oil as opposed to the more expensive and bulkier tanks that are available. This helps to keep costs down and makes the best use of the limited space while achieving the cleanliness goals. The drums have been outfitted with adapters, which are sealed with O-rings to prevent contaminant ingression. Two different contractors were employed to erect the concrete-block building and fabricate the custom stainless-steel sink, shelves, etc. Everything else was completed with mill labor, from the ceiling and equipment installation to the painting, lights, electrical and HVAC installation. The total time to complete the lube room from when construction began was approximately one year. The Upper Occoquan Service Authority (UOSA) is a wastewater treatment facility in northern Virginia with a capacity of 54 million gallons of water per day. 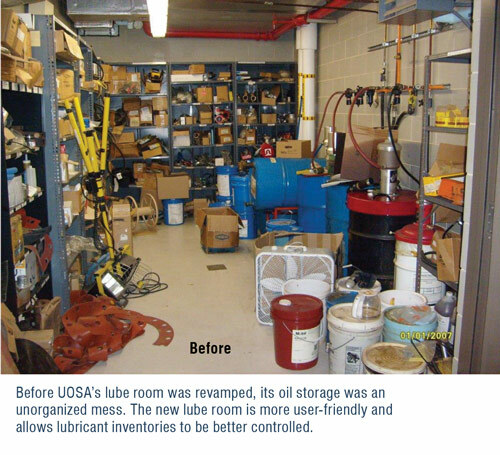 Changes were recently made to the facility’s lube room which greatly improved its organization and usefulness. 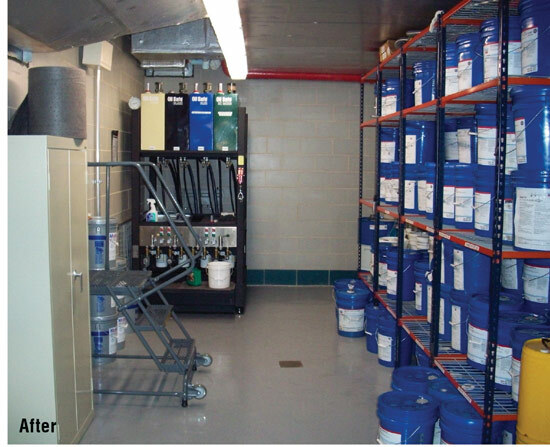 Before the lube room was revamped, most of the plant’s oil was stored outdoors in large metal containment lockers. This created an unorganized mess, and the variable temperatures wreaked havoc on the oil. Now all oil is stored inside the new lube room, which not only is more user-friendly but also allows the supply to be controlled. Currently, hundreds of oil analysis tests are conducted each year on UOSA’s gearboxes and drives. Desiccant filters are used on breathers, and the plant has begun the process of filtering its larger gearboxes to extend the life of its oils. The facility has found that filter carts are a remarkable tool that can save thousands of dollars. The only drawbacks have been the expense of the filter cartridge replacements and the overall size of the carts needed for the plant’s large drives. UOSA plans to buy a large cart for its clarifiers and dedicate it for this purpose. All 37 of the facility’s clarifiers use the same oil, with 10 to 18 gallons in each drive. Several smaller carts may be required for the plant’s other gearboxes, which have drives that hold 2 to 3 gallons or less. In addition, UOSA is retrofitting many of its gearboxes so that oil samples can be drawn from the same location each time. With hundreds of gearboxes and drives, this has been an expensive endeavor. The facility is also trying to determine whether its desiccant breathers are worth the costs. While oil analysis and new oil filtration have been beneficial for the plant, cross-contamination remains an issue. However, everything UOSA has done so far has been a step in the right direction.